Many breweries today will sell you a large glass jug of their beer, known as a growler, to take home with you. They will also refill that container and usually knock a couple of bucks off in order to A) not have to sell you a new container and B) reward you for reusing that jug. 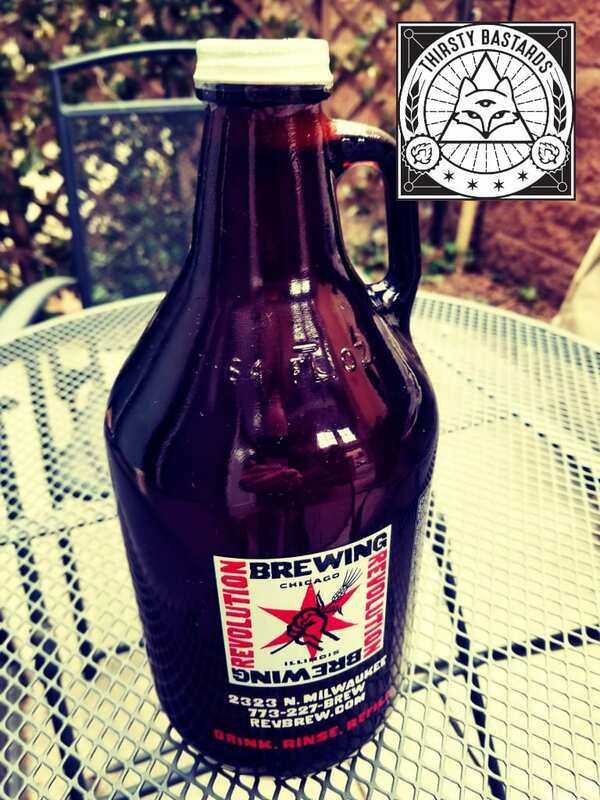 A growler of delicious Revolution Brewing beer. 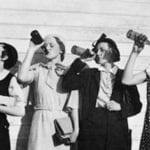 The concept of the beer growler dates back to before commercial packaging of beer was commonplace. If you wanted to take beer home, you needed a clean and nifty vessel in which to get it there. As for how it got its name, there’s some nonsense out there on the internet about the sound of beer gurgling under a loose lid as its transported home. That seems pretty weak to me. Other theories abound. Far more likely, in my opinion, is the theory that the sound of a large, full vessel rumbling across a bar as it is passed to the patron will make a growling sound. That sound would be music to a beer drinker’s ears… and belly! What is a Howler? What is a Squealer? What is a Crowler? How long will beer in a growler stay fresh? So breweries are cool with you bringing in your own container? Why can’t I get a growler filled at a bar? How do I get one of these wonderful vessels in which to transport fresh, delicious beer? Can I Put My Homebrew in a Growler? While there is no standard for growler size, the most common “fill” sold by breweries is 64 ounces. This is the size you most likely will find for sale at your local brewpub, but you may also see a half growler, or “Howler”, as well. There is no governing body that says what the standard is, but if we had to pick one, 64 oz. would be what everyone seems to recognize and sell. “How many beers does a growler hold?” That’s the same as four pints or 5 1/3 12-once bottles! Not quite a six pack, but did I mention how fresh it is? Awww, poor baby! Is 64 ounces too much beer for you?!? Get some friends! We don’t have a source that confirms this, but if we had to guess, a Howler is short for “half growler”. Again, no standard, but the vessel most commonly referred to as a “howler” holds 32 ounces of beer. Naturally, some call it a “squealer”, because what’s smaller than a growl? We’re still waiting for quarter howler, or “Quowler”, to catch on. Another means of taking fresh draft beer to go that is becoming popular is the “Crowler”. You may be thinking, “Oh I get it! It’s the Aleister Crowley of growlers!”, in which case I’d say you’ve been hanging out with Josh too much. Cuz he’d find the idea of a magical, devil-powered beer jug to be hilarious. “Crowler” is short for “can growler” and 32 ounces seems to be the standard size. This requires a special machine to seal it up and they are not reusable. Yes, it’s just a big can, but packaged up fresh. Some folks swear this is the best way to keep it fresh, but once open, you can’t close it back up. More aluminum in your recycling bin, I’m afraid. Our guy, Bob, says he’s also heard crowlers referred to as “stovepipes”. According to Bon Appetit magazine, there 600+ crowler machines out there, so you may be able to find one if that’s your thing. The most common question everyone asks is, “How long is a growler good for?” TL;DR Answer: around 36 hours after opening. 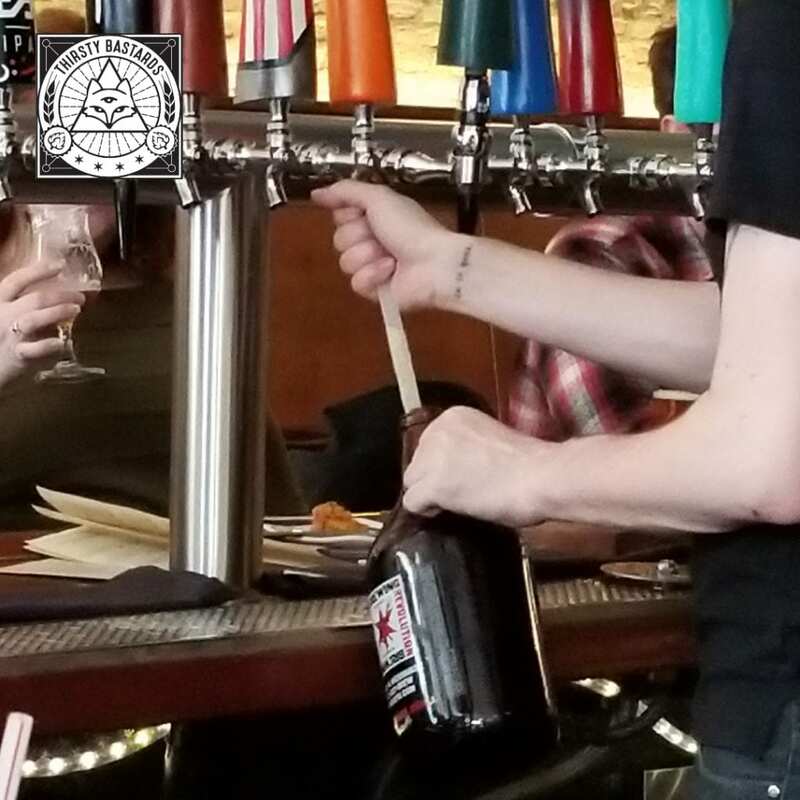 Naturally, as you pour beer out of your growler, you are adding air to the vessel. Beer and air don’t mix well over time, so the clock is ticking. The answer that everyone seems to agree on is that a growler or howler of beer will stay fresh for 36 hours after opening. It’s a good rule of thumb, but circumstances may allow it to last a little longer. According to Wikipedia, while sealed, and assuming it’s been done properly, beer in a growler will last as long as any bottle. We kind of doubt that a standard shallow growler cap will not leak a little CO2 over time. If you have a growler with a swing-top cap, that will probably hold up much better. It seems that there are means of injecting CO2 into the jug to increase its longevity. For our money, you want to enjoy that growler within a week. 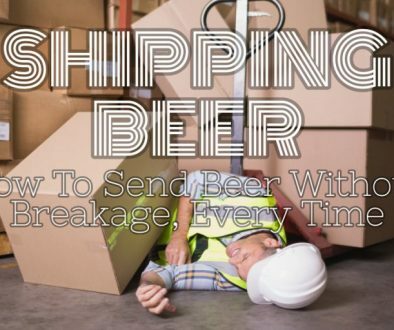 That’s our advice, and we don’t have much science to lean on, but why buy fresh beer if you’re going to sit on it? That said, if you DO want your beer to last for two whole weeks while you enjoy it… What does the “rolls royce of beer growlers” look like? We found it in the uKeg 64 oz Pressurized Stainless Steel Growler. It uses an 8 oz. CO2 cartridge to keep your beer bubbly. It’s also insulated to keep your beer cold and it’s “steampunk AF”! It even comes in a 128 oz. copper version. Yep! Growler filling is pretty much great for everyone. You’re going to share all of that beer, right? Your local brewer LOVES free advertising. Did we mention it’s 64 ounces?!? That’s nearly a six-pack! That said, breweries are NOT always cool with you bringing in empty growlers from other breweries. We’re not naming names, but this one time… we went to a brewery with an empty growler from another brewery… and they insisted on slapping their sticker over the other brewery’s logo. The best part is, that growler went right into a growler koozie with the original brewery’s logo on it anyway, covering up the sticker. If you want to show up in style with your brewery-fresh beer, AND keep it cold, AND keep your finger from breaking off on the little glass handle, you need to get a koozie made to fit a growler. Anything less would be simply pedestrian. Coolie Junction makes a lovely growler koozie with shoulder strap and velcro flap. The ones we have use zippers which aren’t as flexible for different jug variations. Well, filling your own vessel from any tapper is not always legal, depending on where you live. The Brewers Association created a nifty database of the laws in each state in the US. 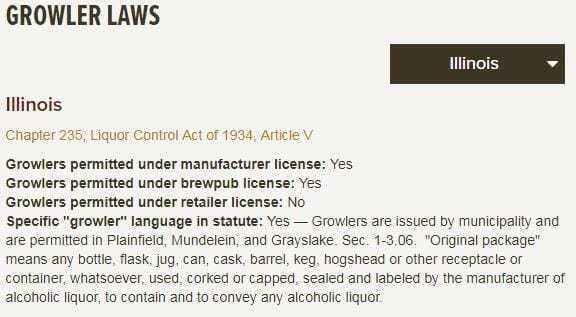 For each entry, you can see what the laws are around growler filling for manufacturers, brewpubs, and retailers (bars) and even whether there is specific language “on the books” around growler filling. It’s very cool! Whereas Texas retailers and brewpubs CAN fill them, but manufacturers CANNOT. Weird, eh? Head over to your local brewpub, taproom, or brewery and see what they have on the menu. Call ahead to make sure they do growler fills. Or don’t and take a chance, because they will still let you drink there. Not all draft offerings from a brewery will be available “to go”. That 12%, barrel-aged, rare imperial stout you love? Sorry. 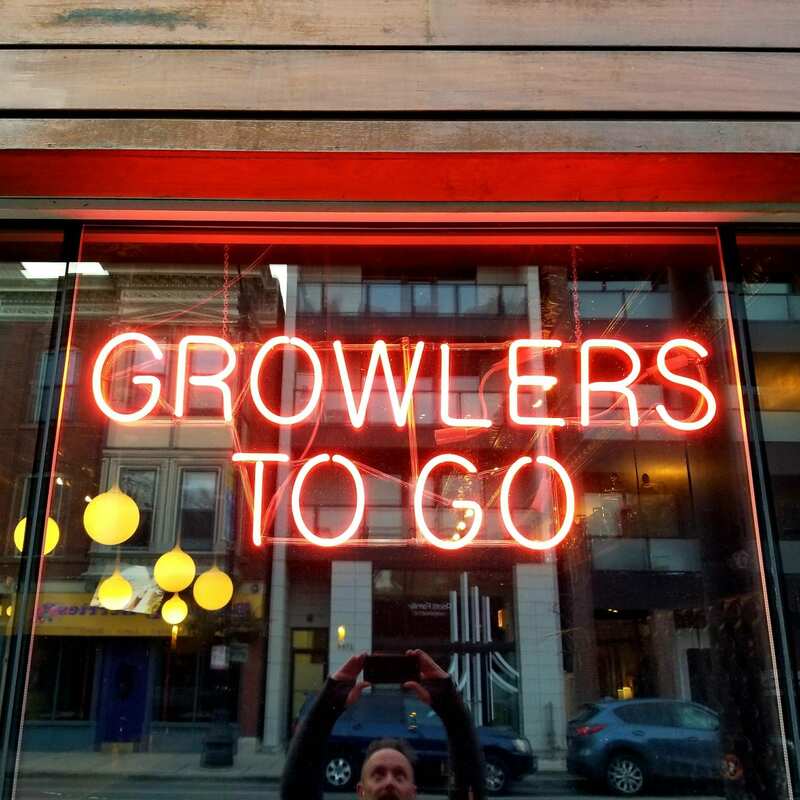 Since everyone has a better idea about how to transport beer, the growler craze has generated its own little industry. You can find sturdy stainless steel jugs, fancy, pinkies-out, ceramic vessels, and even C02-powered mini portable tapper dispensers. Again, most breweries will be happy to fill the growler you bring, assuming it isn’t too weird. If you aren’t buying something opaque, always choose brown glass to keep the light out. The DrinkTanks Vacuum Insulated Stainless Steel Beer Growler is a great option because it comes in several colors and is dishwasher safe. DrinkTanks Vacuum Insulated Stainless Steel Beer Growler, 64 oz. Another great option is KegCo’s The Grizzly – 64 oz Double Wall Stainless Steel Flip Top Beer Growler. The wide mouth makes it easy to clean. If you are bringing your own, make sure it is clean. 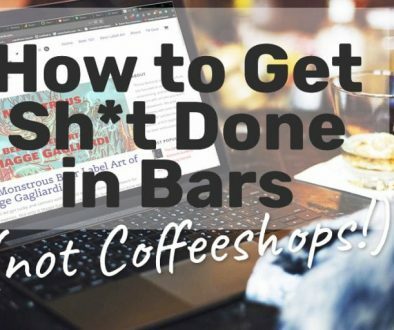 The bartender will likely give it a rinse before filling it, but getting it clean is your job, not hers. 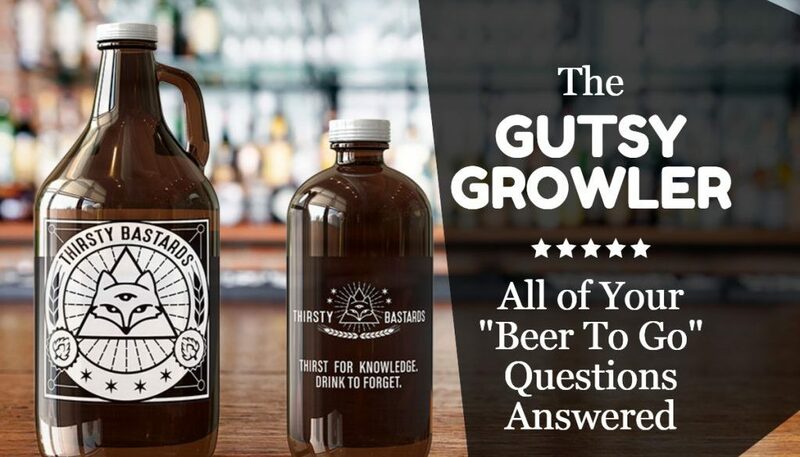 Because of the volume of liquid, filling a growler isn’t like pouring a glass of beer. While the intention is that the beer will be consumed soon-ish, splashing around a bunch of air in your jug is bad for shelf life. Also, keeping the head to a minimum will help you get the most volume in the jug. 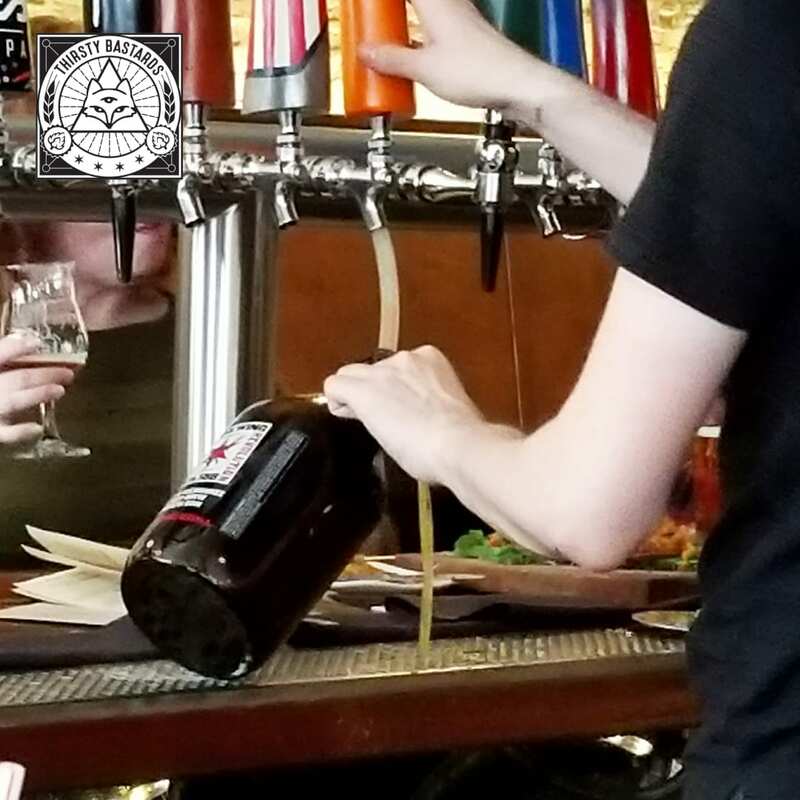 You will often see bartenders use a short hose to deliver the beer directly to the bottom of the growler. They will also prop the jug up at an angle so that when the foam gets to the top, it will cascade down the side and into the drain. It looks messy and like a waste of good beer, but trust me, she knows what she’s doing. Using a tube from the tapper to fill a growler. 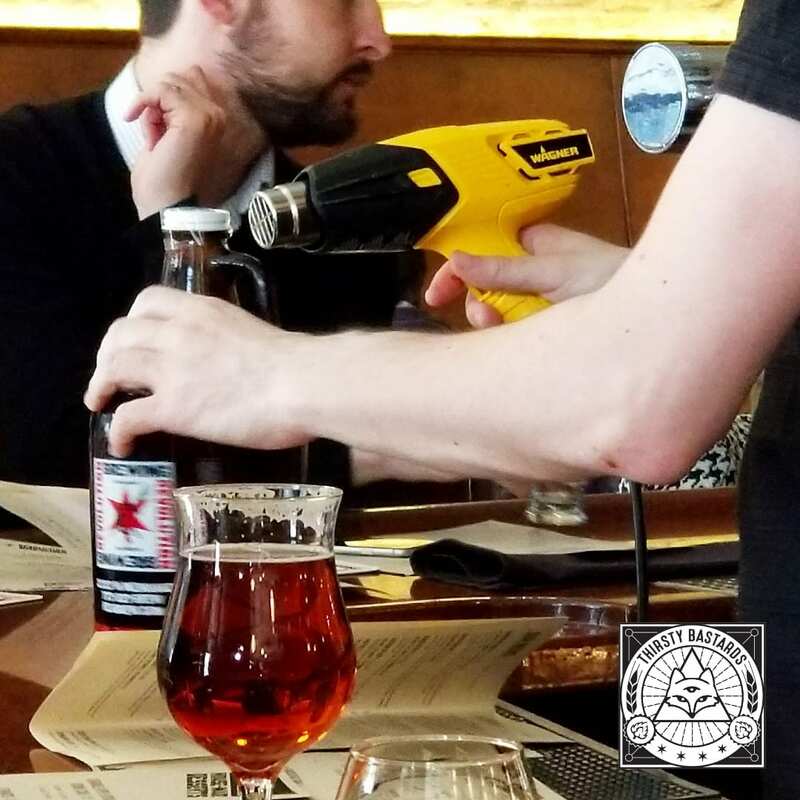 After your growler is full, the bartender will cap it up. 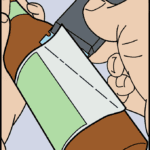 It’s also very common for them to put a small plastic sleeve over the cap and use a heat gun to shrink it tight. Repeated openings and closings of the shallow cap of a growler are sure to degrade the quality of the seal. Those caps can also rust, eventually. For this reason, brewpubs will nearly always fix you up with a fresh, new cap when you bring in your own growler for filling. Reusing your growler is what it’s all about. Even though you’ll be consuming your growler’s contents fairly quickly, bugs and cooties can degrade the freshness of the contents inside. It’s vital that you clean it as soon as it’s empty. Throw the cap away. It’s not reusable unless it’s a swing-top cap. If you can’t properly wash it immediately, give it a good, very hot rinse. Put a single drop of dishwashing liquid in and give your growler a soapy swirl. Use a sponge or scrub pad to scrub the opening. You want to get any residue off the threads of the top. If you see sediment at the bottom, you need to get at that with a bottle brush or dishwashing brush – something with a handle that you didn’t use to clean your toilet. Use some soap, but not too much! And rinse like the dickens! Let as much water drip out of the growler and let it air dry. If you can’t dry it with the mouth down, check in on it every couple of hours and shake out the water that comes to rest at the bottom. Store it in a cabinet until you need it again. Pro Tip! Keep a growler in the trunk of your car! 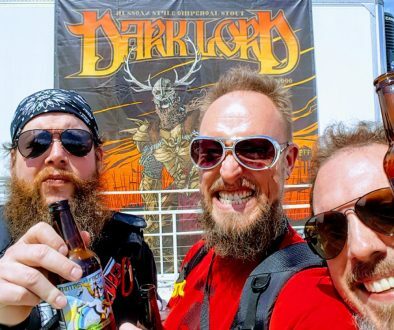 If you are out and about and spot a new brewery, you’ll be glad you did. Fresh Beer Opportunities! Wrap the top with a bit of foil so nothing weird falls into it. A stray lugnut will bust up the inside in no time! Did you just keg up a five-gallon batch of homebrew and want to take it to a party? Heck yeah! Again, you probably want something with a swing-top cap if it’s going to sit for over a day. You beer must be fully carbonated before you pour it into the growler. Remember to run a hose into the bottom of the growler to reduce the amount of oxygen and fill from the bottom up. If you do have extra growlers laying around and want to use them instead, you can buy replacement caps and shrink-wrap sleeves just like the breweries use. Just remember that those caps can rust and don’t last very long. Opening and re-tightening them will bend them out of shape pretty quickly in our experience. Toss them when you’ve used them for a full single growler. Shrink bands provide a professional look to your products while simultaneously offering a tamper evident safety seal. Not only is a tamper evident seal required in most cases, but it also gives your customers confidence that your product is safe for use. Examples of products this works best with: Growler bottles, pharmaceutical bottles, gallon jugs, honey bottles and various other types of containers. As there are many different types and sizes of containers, it is best to measure your specific diameter to ensure you purchase the correct size!